I have noticed that in your work you mix found objects such as rocks, minerals, nails and keys with photography and cartography to form a cohesive piece. How did you come up with this concept? I have been interested in maps for a long time, and archeology, and history. 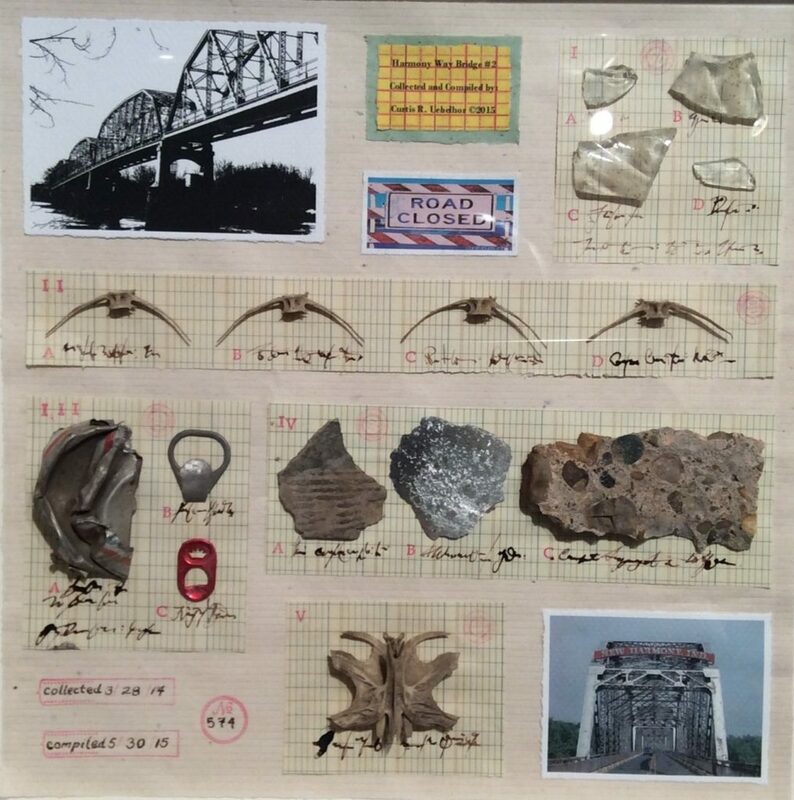 I’ve been doing Drive by Archeology collage since undergraduate school at USI , back in 1978. The most recent pieces, the “Drive by Archeology” pieces, have brought together materials I have had for a long time. The paper grids, and graphs, then collecting things on site at buildings and various places in the area. Putting a lot of interests I have had together in a more cohesive framework. Are the locations for these pieces as important to you as the work itself? When I originally started doing the “Drive –by Archeology “ series in 2013, I was serving as interim director at the New Harmony Gallery, where I had worked in the 80’s into the 90’s. In the evenings I had a lot of time to kill, and I was staying in a place that the University of Southern Indiana provided and I wanted to leave an artwork there as a show of appreciation. I collected things as I walked around the yard, and used that with other things I could collect as documentation. That kind of grew into doing pieces about specific places in New Harmony in anticipation of the town’s 200th anniversary. Then I tried to scope out other places in the tri-state that are interesting buildings and interesting grounds, which I could have access to, places that aren’t cleaned up, that still have objects around the buildings. Some of the buildings are in various states of disrepair, like the Henderson Train Depot. I went around there and collected a lot of things. I could do a whole series on that location itself because all of the things around it, but also because it is a really neat building. It is a sort of a combination of the architecture of the building, the history of the building, and the availability of items around the building. Your piece Optics Study #1 seems to be a play on how people visually perceive both art and the world at large. What do you think is more important, the way people see art, or the way it makes them feel? I guess how you define the way they see art. Optics have always been of interest to me because I have worn glasses since I was in the first grade, and I couldn’t see the chalkboard. That changed a lot of things for me. In teaching art to kids, I talk about the elements of art. Color is probably the most complex of the elements of art. When you talk to students about color and see the wonder that comes across their eyes, the light bulbs that click on, because they have never been talked to about color and how it works, the amazing things you can do with color, and the symbolism of color, it really is cool. That was one of the reasons for doing “Optics Study # 1”, and I hope to do some more as a series. For one of our latest shows you got to mentor a pupil with autism to make an illustration for an art show. Describe to me that experience. The student, Will Hosford, has taken art classes in 6th grade and 7th grade. I only have these students for 9 weeks at a time. In those classes we have assignments that we do, and it has been a learning experience for me because we do not have a lot of experience with kids with Autism. Getting Will to be engaged with assignments, and seeing how he interprets the instructions that I have as opposed to the other students has been a very interesting learning experience for me. But when this Autism show became available, I was able to give him non-assignments. I was able to say “Will, here’s some paper, do what you want with it”. Giving him that freedom was an eye opener for me, because he was able to just sit down and draw from memory things he has seen in magazines or books about prehistoric creatures, and drawn them accurately. He also came up with hybrids of creatures that don’t exist. His drawings were amazingly quick and detailed, and I told the other students “I can’t draw like that”. He has the ability to do something out of his head that is very accurate and very fanciful. I am in a way envious of what he does. It was really great for me to let others see his work that I had just experienced for the first time, and to see other people react in the same way I did. They were amazed and pleased with what he had done. I told the kids at school in his homeroom what he had done, and they gave him a standing ovation. He didn’t quite know how to react to it, but he did get a big smile on his face. Are there any artists who you can inspire you or influence your work? Most definitely Joseph Cornell, he was very active in the 1930’s and 40’s as a fringe member of the surrealist movement. I consider him to be one of the grandfathers of collage and assemblage. Robert Rauschenberg has been a big influence, James Rosenquists imagery…I guess there are a lot of artists that I look at. Jasper Johns, Andy Warhol, certainly, Roy Lichtenstein. A lot of pop artists I enjoy and use as sort of a springboard. Some contemporary artists like Sue Coe, who does a lot of a drawing and has a very political bent to her work. My work is not like hers, but I use her as an inspiration. I also like the graphic style of Shepard Fairey’s prints, collages and paintings. Does the geography of a site influence the way your individual pieces look? In the “Drive-by Archaelogy” series, I’ve done 3 that are about the Harmony Way Bridge, the bridge that spans the Wabash River. It has closed because of its deterioration, and there has been a lot of talk as to what they are going to do with it. Hopefully something will be done in the very near future before it falls into the river. The structure of the bridge itself influences the way I group things, I try to mirror some of the structuring of the bridge itself in my work. I found several fish that had become stranded in the backwater. I found their skeletons, and the bones of the rib cage mirror the top part of the bridge. That bridge has been such a wealth of information because there are so many things there, and it has continued to change with the flooding and the receding of water underneath the bridge. I noticed you use graph paper or maps as a background for your found objects. Does this help you establish a sort of hierarchy in your work? I have collected graph paper since I was in middle school. The structure of the graph paper has something that speaks to me. I use it in these pieces because I want to have something that is an immediate organizational tool and has reference to science. I did a piece on Thrall’s Opera house in New Harmony, and instead of using graph paper I used musical notation paper. I used the structure of that paper to organize the various objects in that piece. I use it also because it has nice straight lines, and I use that for the markings that I put underneath each specimen. The markings and faux handwriting are meant to represent what you find in all the drawers you can pull out in a science lab or museum in which you can see fossils that someone 50, 70, or 100 years ago or more and are labeled very meticulously . The graph paper provides this structure, but can haves all sorts of layers of referencing as well. If you were commissioned and given unlimited funding to create pieces at sites worldwide, which countries would you visit first and why? What immediately comes to mind is the great cathedrals in Europe. Probably places in former Soviet countries would probably have a wealth of material. The places I get the best stuff from are places that have not been well kept. I went to do a collage of Saint Joseph’s Church in Jasper and came up with nothing because they take care of their grounds so well, so there was nothing to collect. Cathedrals and Goverment buildings would be things I would be really interested in doing. Places that are sort of off the beaten path that are allowed to exist in their natural state rather than being sanitized on a daily basis, and locations which hadn’t been picked clean by passers by. How do people tend to react to your work? It depends on the location. A lot of the ”Drive by Archeology” pieces that I did in New Harmony have been been displayed in the New Harmony Gallery of Contemporary Art. People that are visiting the gallery react to them very positively because they have just seen those sites. It is interesting to get a reaction from pieces like the Henderson Train Depot from people in New Harmony. They are reacting to it in a totally different respect, They react to it as a piece of art, not just a location they know personally. Sometimes they aren’t aware that place really existed. That place is a real architectural gem, but it’s off the beaten path and is basically crumbling down. What requirements does a site/location have to fulfill to pique your interest? A place that I would have access to, and would have items that I can collect. When I do a “Drive- by Archeology” collage, I collect with a cardboard box or a bag, and pick up items off the ground. I don’t dig in the ground or anything like that. It is just stuff that’s on the surface that I collect. I usually don’t use a lot of contemporary objects in my work. I don’t use candy wrappers, or anything like that. If I use a soda tab or something like that, it is usually something that has been pretty well worn. So I look for things that have an aged patina to them when I collect things, which can be problematic. I did a piece on the Technology Building at USI, because when I attended the university I had a lot of classes there. I was invited to be in the 50th anniversary show there. I walked around the building looking for old things, but there weren’t that many because the building wasn’t too old. I used more contemporary objects that I found there. Since the building was a newer building that made a lot more sense. What does the future bring for Curt Uebelhor? The election will influence some of the things going forward. I don’t have any shows per se. I am still on the lookout for my places to do my “Drive-by Archeology” pieces. I would like to pursue some more “Optics” pieces, possibly using some lenses and different optical objects to include in the piece that change your perception of the piece as you walk by it. Magnifying certain areas and things like that. I am getting closer to retirement and that will make a great difference in getting things done. Right now teaching full time, it can sometimes be difficult to do a full body of work for exhibition in a gallery or museum. Hopefully that will change.